The pool at the American Embassy in Khartoum was the only place to go to escape the heat. It was 137 degrees when we arrived. My friend Barbara and I were so eager to see the city, we decided to ignore the temperature and went out exploring. When we didn’t return for six hours, the staff at the embassy was worried. There was no shade anywhere and we’d crawled under an uncoupled train in the yards to get out of the sun and passed out. After that, we joined the crowd and sat at a table under an umbrella on the embassy patio for most of the day. They had cold lemonade and it was the gathering place of everyone who wasn’t Sudanese. If there was another pool anywhere in Khartoum, it was a well-guarded secret. We were excited about the prospect of crossing the Sahara from Sudan to Ethiopia, but unprepared for the information we received. In order to get the necessary permit, the vehicle had to be four-wheel drive and we needed proof we were in a convoy of at least three. Our only preparations had been splurging for a Michelin map so detailed it showed every sand dune in the desert and the wide-track tires they had talked us into getting back at the auto factory in West Germany. We planned to buy a compass in the city, but I thought the store prices were outrageous and decided we could just follow the sun. One afternoon, two tall men in dark sunglasses sat down at our table and without introductions, bluntly told us we should get out of Khartoum. Apparently a rumor was going around town about a “surprise” coup, and there was a great flurry of activity when we arrived at the transportation ministry to try to talk our way into getting a permit to cross the desert. We lied and said we were in a convoy, they threw some papers at us, we paid and left. No one even came outside to check our vehicle. So at five o’clock the next morning, after changing a rear tire that had gone flat, we left to cross the Sahara in our red Volkswagen. Without a spare. Everyone should experience true desert once in their lives. 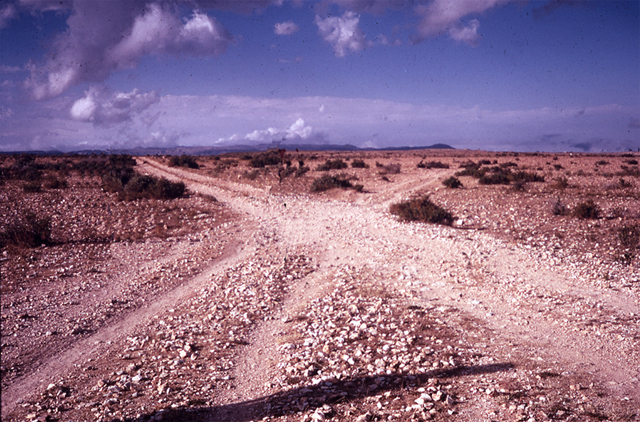 It begins with no roads–just a myriad of tracks heading in all directions without a single structure for a landmark. Not one thing interrupts a completely empty horizon which makes navigating a challenge even if drivers have a good sense of direction, which Barbara and I did not. At first you playfully zigzag, such freedom to drive anywhere you want! And then the heat hits you and you stop fooling around. Travel is only for morning and late in the day. Midday we sat under an improvised blanket tarp fastened to the open car door. We had gallon containers of petrol, a trunk full of tinned food, and water that no matter what we tried, turned hot. Drinking hot water when you’re desperately thirsty keeps you alive, but not from longing for something cold. But the nights; ah, the nights. When I was a child my parents bought me a globe at the Hayden Planetarium that they’d plug in my room and I’d fall asleep under a ceiling of constellations. It was like that. Without the sound of a bird, a leaf or branch to rustle, or the din of traffic in the distance, we experienced absolute silence for the first time in our lives. It didn’t seem we were still on planet Earth. During my first crossing of the Atlantic on a French freighter, I loved to stand alone on the deck surrounded by nothing but the sea. You get the point quickly that we’re pretty small and much of what we spend our time doing is meaningless. The Sahara Desert of Sudan embodied this feeling. One leaves these places determined to spend more of your life doing what you love. Without having to live through some crisis, I’d learned at the age of twenty-four what really mattered to me. When we saw five huge sand dunes on our left, we realized we were lost. The only similar sand dunes on our map were way west of where we should have been, so the “we’ll just follow the sun” plan wasn’t working very well. Barbara had seen a program on TV with tips on how to determine direction if you find yourself in a situation without any equipment. Looking for moss on a tree trunk wasn’t an option, so we tied a string to the eraser end of a pencil, planted the pencil point down in the sand, held the string taut, and indeed it cast a shadow. When I asked Barbara which direction was the shadow and she said she didn’t remember that part, we couldn’t stop laughing. About two hours after turning and driving towards what we guessed was approximately east, we saw camel tracks in the sand and decided to follow them. No animal could survive alone, there had to be people. The two men were fabulous in their billowing indigo blue robes and white muslin head and face wrappings and they motioned for us to follow them. Back at their camp, women with jewelry-laden wrists would only peek from behind the tent opening. Before we left, the men crouched on the ground and drew pictures in the sand with their fingers to show us the way towards the Ethiopian border. As a departure gift they presented us with a tin of halvah; we gave them a large tin of canned peaches in return. They mounted their camels and through our rearview mirrors watched them running behind the car waving goodbye as we drove off. Today the thought might cross my mind that they could take all of our things, bury us and the car, and no one would ever know. But it never would have occurred to us then, and I know it never occurred to them either. 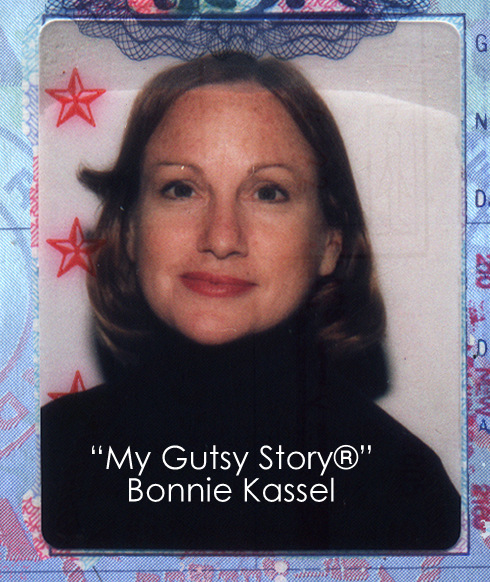 Bonnie Kassel Bio: I have been an artist and traveler all my life. Sketches I drew in Mayan jungle temples and Ethiopian Coptic churches remain a source of inspiration. The blazing saffron silks of India and copper markets of Turkey influenced my palette and led me to work in metal. Kitchens in Belgium, Morocco, and Syria changed the way I cooked. Most of the milestones in my life played out in other countries. Only when I was older did I realize how deeply I was marked by my travels and how everything I am and do grows from them. Sonia Marsh Says: I can visualize both of you, inexperienced drivers in the desert, giggling and being “gutsy” without truly realizing it at the time. In those days you simply viewed it as an adventure; today we would consider it dangerous. I love the realization that you came to Bonnie, in your twenties. 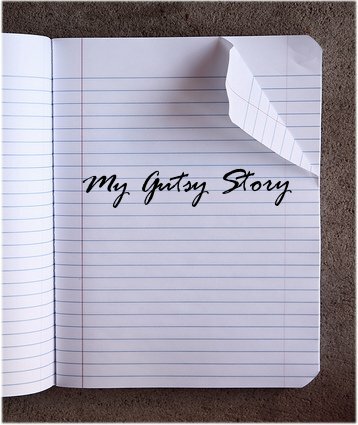 February has 4 amazing “My Gutsy Story” submissions. Now Bonnie, that’s what I call a “gutsy” trip for two young women. Would you do it again today? After finding my dream house for a long-term rental in Turkey, the owner turned me down when she learned I was a single woman. That night over dinner, a Turkish friend laughed when I told him I was going to go back and offer her more money than she was asking. “You’re thinking like an American. Her reputation in the village is more important to her than money.” It was 1976. The pursuit of money and “stuff” that has now permeated almost every culture–particularly in cities–dramatically affects my answer to your question. The nomads in the story have not changed, I’m not more fearful, and it’s not because I’m a woman, but to be seen in Khartoum loading a car with clothes and cameras and be carrying the cash necessary for such a trip, would no longer be possible. I write this with a real sense of loss. So it is sad that cities around the world are not as safe due to the pursuit of money and “stuff,” as you say. It’s so sad that once a play modernizes and grows, we have to be more cautious. What an adventure and such a great story! Well done on a great adventure! You made me smile. Glad you liked the story, but I think there are easier ways to get halvah! I don’t know anyone else like you Bonnie! “Gutsy” only begins to describe your adventures. Your beautiful writing has taken me to places I never imagined (and to others I never heard of)! Desert or dessert? There’s no confusion here! The author finds them both in one extraordinary experience. This tale speaks to the unique richness of traveling while young. The expectation that things will work out is confirmed by the unexpected hospitality of the world’s denizens. In this case, two young travelers, lost in the desert, find their direction with the help of two nomads, and leave with dessert! 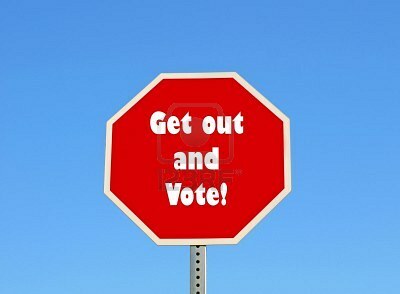 This gutsy one gets my vote! Great story. We used to live in Ethiopia and went to Djibouti one time. It certainly was HOT. We came home via train and it went so slowly that people would get off and walk alongside the train and then get back on. I can feel the heat as you described it. Stated perfectly, Amy. You went to Djibouti ONE TIME. Have you ever met anyone who went more than once? What year were you in Ethiopia, where did you live and what work were you doing there? One sentence reply will be fine. Just curious. Your writing is so vivid that I feel as if I am experiencing your adventures first-hand. How exciting to have been able to travel during this time and how beautifully you convey this to your readers. Well done! Can I ask a daring question: what would have happened if you had had a flat tire in the middle of that desert? Beautiful adventure, well done! My life seems quite maeningless compared to yours!! If we’d gotten a flat tire it would have been a huge problem that I tend not to think about. Even now, I have a belief (which doesn’t always make sense even to me) that things will work out one way or another and rarely have a Plan B. Years of traveling reinforced this way of thinking. 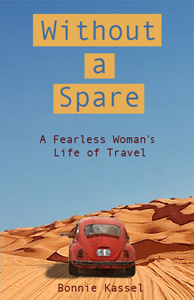 You figure things out as you go along, which is the essence of my book Without a Spare. As good an example is Sonia’s book, Freeways to Flip-Flops, which I just finished five minutes ago and highly recommend. Moving her family to Belize didn’t turn out as she “planned” and they returned home. But during the time they were there, glorious life-changing events she never could have anticipated broadened her children’s lives forever. It would be fun to discuss this topic as I am in the mood to do another “gutsy” move. Thanks for your kind comment about Freeways to Flip-Flops. I look forward to reading yours when I’m done with two I started. For a “gutsy” move, check out GlobetrotterGirls.com Jess and Dani (American/German couple) travel the world full-time–often as house sitters–and they’ve written a comprehensive eBook on the subject (available on Amazon. Their readers have posted stories on the Globetrotter website about experiences in a house with infinity pool on Fiji, one at the edge of an Oasis in Morocco, another on a Amsterdam canal houseboat, etc. You have to be an animal person, as almost all the requests are for people to care for beloved pets. I most recently rented a house in Oaxaca long-term, but I’d never considered house sitting as an inexpensive way to stay in another country long enough to absorb the local culture and feel part of the community. So many different possibilities are out there to see the world. What you did was brave, gutsy, and foolhardy, but that’s the spirit of adventure in you. You can’t plan adventures, or plan for potential disasters, and like you I might not have been able to afford a compass, but that wouldn’t have deterred me. What an unforgettable experience that, as you say, could not be repeated nowadays.